The poster for UFC 218: Holloway vs. Aldo 2. After previously contesting two events in the Metro Detroit area (and the first since UFC 123 in November 2010), the event was the first for the promotion at the newly-built venue. A UFC Featherweight Championship bout between current champion Max Holloway and former UFC Lightweight Champion Frankie Edgar was expected to serve as the main event. However, on November 11, Edgar was forced to withdraw from the fight citing injury. He was replaced by former WEC Featherweight Champion and former two-time champion José Aldo. Aldo was scheduled to face Ricardo Lamas at UFC on Fox: Lawler vs. dos Anjos in a rematch of his successful title defense at UFC 169 in February, 2014. Holloway and Aldo met previously at UFC 212, with the former defeating the latter to win the championship. A UFC Heavyweight title eliminator bout between former K-1 Grand Prix champion Alistair Overeem and up and coming contender Francis Ngannou co-headlined the event. The winner would be matched against champion Stipe Miocic for the title. Miocic had previously defeated Overeem by first round knockout at UFC 203 in September 2016. A flyweight bout between 2008 Olympic gold medalist in freestyle wrestling and former UFC Flyweight Championship challenger Henry Cejudo and Sergio Pettis, initially scheduled for UFC 211 before Cejudo pulled out with a hand injury, was rescheduled for this event. Subsequently, Cejudo's availability for the event was briefly in doubt as he suffered minor burn injuries to his right foot on the evening of October 9 as he was evacuating his hotel as a result of the Tubbs Fire near Santa Rosa, California. The following day, his management team confirmed that the fight with Pettis was still on for the event. Al Iaquinta was scheduled to face Paul Felder at the event. However, Iaquinta pulled out of the fight on October 31 citing an injury. Felder remained on the card against Charles Oliveira. ^ For the UFC Featherweight Championship. ^ a b Staff (2017-12-03). "UFC 218 draws reported 17,587 attendance for $2 million". mmajunkie.com. Retrieved 2017-12-03. 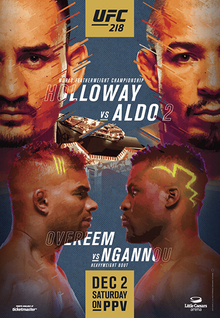 ^ "UFC 218: Holloway vs Aldo 2 Event Page". ^ a b Christopher D. Thomas (2017-07-30). "Little Caesars Arena to host UFC 218 in December". freep.com. Retrieved 2017-07-30. ^ Brett Okamoto (2017-10-03). "Max Holloway to put featherweight title up against Frankie Edgar". espn.com. Retrieved 2017-10-03. ^ Ariel Helwani (2017-11-11). "Max Holloway vs. Jose Aldo 2 slated as new UFC 218 main event". mmafighting.com. Retrieved 2017-11-11. ^ Staff (2017-10-13). "Jose Aldo vs. Ricardo Lamas rematch co-headlines UFC on FOX 26; Perry-Ponzinibbio, Mein-Silva added". mmajunkie.com. Retrieved 2017-11-11. ^ Dave Doyle (2017-06-04). "UFC 212 results: Max Holloway finishes José Aldo, claims featherweight crown". mmafighting.com. Retrieved 2017-11-11. ^ Ariel Helwani (2017-09-27). "Henry Cejudo vs. Sergio Pettis targeted for UFC 218". mmafighting.com. Retrieved 2017-09-27. ^ Ariel Helwani (2017-10-10). "Henry Cejudo suffers burns, loses gold medal in California wildfire". mmafighting.com. Retrieved 2017-10-10. ^ Mike Bohn (2017-10-10). "Manager: Henry Cejudo will fight Sergio Pettis at UFC 218 despite injuries, lost Olympic medal in fire". mmajunkie.com. Retrieved 2017-10-10. ^ Ariel Helwani (2017-10-31). "UFC 218 loses Paul Felder vs. Al Iaquinta". mmafighting.com. Retrieved 2017-10-31. ^ Steven Marrocco (2017-10-31). "Al Iaquinta out, Charles Oliveira in against Paul Felder at UFC 218". mmajunkie.com. Retrieved 2017-10-31. ^ "UFC 218: Holloway vs. Aldo 2". Ultimate Fighting Championship. Retrieved 2017-09-27. ^ Staff (2017-12-03). "UFC 218 bonuses: Amazing night of fights forces two "Fight of the Night" awards". mmajunkie.com. Retrieved 2017-12-03. This page was last edited on 1 January 2019, at 09:34 (UTC).